CAFFEINATED – PACIFIC SHAVING CO. 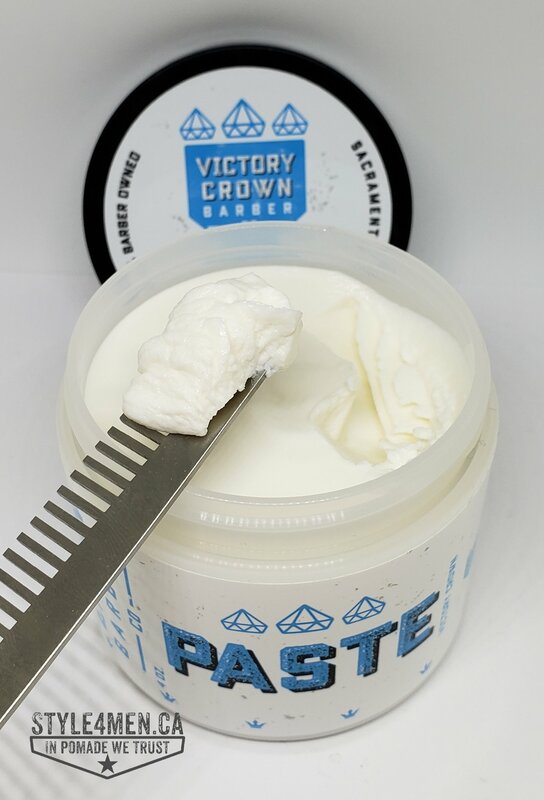 PASTE by Victory Crown Barber Co.
Having been very impressed with the Victory Crown Barber Co. SLICK pomade, I continued my testing with their PASTE. In previous tests when working with pastes, I have often found that as interesting of a solution as paste might be there was very little grip to be found. 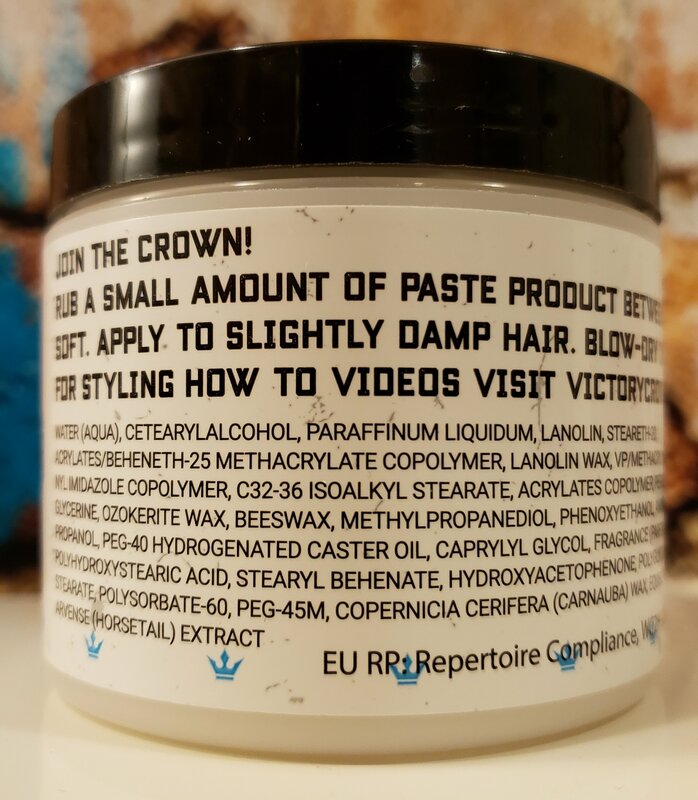 The Victory Crown PASTE totally surprised me and turned out to be quite the opposite. 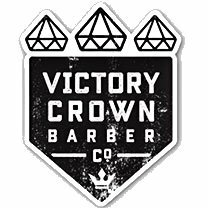 Shout out and thank you to Cierra at Classic Barber Products who is the distributor of Victory Crown for making this review possible. The test stage was as follow: clean and dry hair. As per the label instruction which suggest to work the paste into damp hair, I applied a bit of moisture with a barber water spray bottle. Then scooped out about the size of a Canadian nickel of the said paste. The product is very smooth and is easy to relaxed in your palms. Onto the application. Back to front, left to right, right to left and front to back! The idea is to get the product everywhere as evenly as possible and not to concentrate the paste in your bangs which would saturated that area and not give you the desired outcome. While the product was still active, I comb everything in place. I like to use a hair pick for the top as it the best tool for my long uppercut and it also helps provide a good lift up front. I use a very tight comb for my sides which are faded from 0.5 to 2. By then I felt that the product started to stick and dry in place. Previously, this is a type of product that I have found hard to work with because of quick seizing. Not victory Crown! It dried but remained smooth. No flakes or crunchiness. In fact this brings us to the overall feel in the hair, this stuff felt as it I had nothing at all. Incredibly nice to the touch. OK, what about the hold? Again, I was totally impressed as my hair stayed styled the whole day. No constant re-combing required. I left Style4men headquarters at 8 AM and it’s now past 5 PM and I don’t need to take care of anything in this area. Scent wise, this product is not as present as the SLICK pomade. The aroma is more timid and distant, but you will recognize the bitter apple fragrance. Pastes are typically more complex products requiring a lengthy list of participants. This is true here as well, but there are a number of important and healthy players worth mentioning: Castor oil, Beeswax, Carnauba wax. 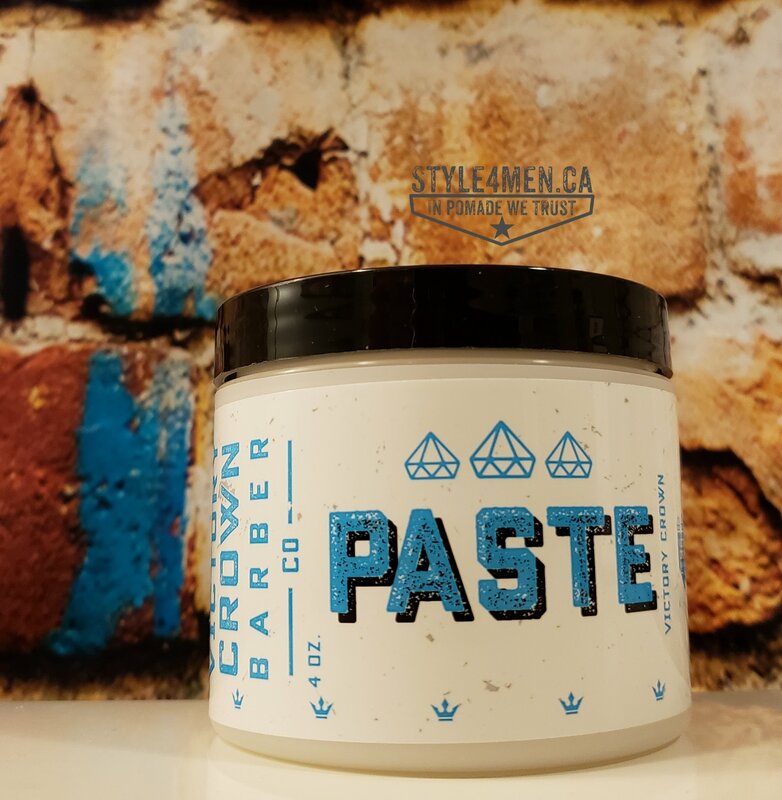 This is the second paste I work with that offers unexpected and proper hold and I am starting to think that we might be looking at a new wave of superior hair pastes. Sign up here for the newsletter! SLICK by Victory Crown Barber Co.
Styling Cream by The Stickmore Hair co.
Style4men.ca is a participant in the Amazon Services LLC Associates Program, an affiliate advertising program designed to provide a means for sites to earn advertising fees by advertising and linking to amazon.com.